BAC Dividend Hike on Hold After Stress Test Shows "Weakness"
Subject: BAC Dividend Hike on Hold After Stress Test Shows "Weakness"
Results of the U.S. Federal Reserve's so-called stress test were released Wednesday – and Bank of America Corp. (NYSE: BAC) passed only provisionally. As such, a long-awaited boost to the BAC dividend remains on hold. In total, 28 U.S.-based banks passed the Fed's annual regulatory test aimed at assessing whether they can survive a financial and economic catastrophe. Failing were the American units of German banking goliath Deutsche Bank AG (NYSE: DB) and Spain's Banco Santander SA (NYSE ADR: SAN). The Fed said Bank of America, the nation's second-largest bank by assets after JPMorgan Chase & Co (NYSE: JPM), showed some weakness in its internal controls. Those weaknesses were limited enough that the Fed avoided flunking BofA. Still, BofA could fail later this year if it doesn't fix "deficiencies" the Fed identified. The conditional pass marked BofA's third stress test snafu in five years and stoked fresh questions about its ability to comply with new regulations targeted at making the financial system safer. In 2011, the Fed denied BofA's request to modestly increase its dividend. Last year, BofA passed the stress test – initially. The Charlotte, N.C.-based bank got the Fed's okay to make shareholder payouts and implement a share buyback. 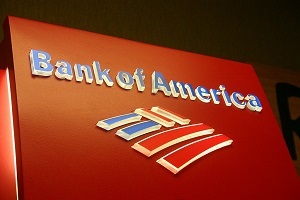 A few weeks later, however, BofA discovered errors that led it to overstate its capital by $4 billion. The blunder prompted the Fed to tell BofA to suspend its share buybacks and put a stop to a planned BAC dividend increase. BofA shares tumbled more than 5% to $15.13 on the news last April.